This past Saturday at Station 7 Stellar Fights featured Top Flight MMA Knock machine, James Williams, winning the light heavy weight title from reigning Champion Rodney Guignet in the main event of the night. Now that I have this belt, you know what would be even better? To have another one on my shoulder, I want the 185 title now! In the world of sports competition, medals, ribbons, and trophies are among some of the tangibles used to signify who is number 1, but none can validate like a big shiny belt around the waist of winner. The belt shows just who exactly is the champion and James Williams, of Top Flight MMA Academy, now has his own belt to show he is the new champion. This past Saturday, Stellar Fights put on another great night of MMA action, probably the best one to date. Most of the fights ended in KO or Submission and the few that did go the distance were all "fight of the night" candidates. In the highly anticipated main event, Champion Guignet, and challenger Williams put an exclamation point on the whole event. 48-year-old Guignet had been the reigning champion for over a year and was looking to remain the champion. Undefeated Knockout artist, Williams, had different plans. The bout started with both fighters keeping intense eye contact with each other, with Guignet jumping and stomping on the mat, prompting Williams to leave his "pre fight Jon Jones crouch" and start to swaying side to side. The tone for the fight was set. The bell rung and both fighters touched gloves. Guignet immediately engaged Williams with powerful leg kicks. Williams then tried to time the kick with his own stiff jab, the same one he used in his last fight to get a 9 sec knockout. The jab was landing, but Guignet proved he was able to take a punch and continued to kick the leg of the taller Williams. Williams was forced to start checking the kicks with his shin and started pressuring Guignet more with his jab and cross. Guignet finally tried to get the match to the ground but the shot was stuffed and Williams was able to scramble out and land his own series devastating knees from the muay thai clinch. The round ended with Guignet landing a takedown. Second round started with Guignet going back to his leg kick, as he reasonable success with them in the first round. Williams continued to pump the jab then Guignet landed a big left hook that woke up Williams. Guignet pressed in hard after finding a spot with his left hook but ran right in to Williams big right hand flooring him. Williams then quickly jumped on Guignet for the finish. Williams, victor by 2nd round KO and Stellar fights' new light heavyweight champion. After finally seeing the 2nd round for the first time, Williams had this to say about the former champion, "I don't care how old this guy is, he is tough! I hit him with some good shots and he stayed right there." Williams also added this, "Now that I have this belt, you know what would be even better? To have another one on my shoulder, I want the 185 title now!" Williams improves his MMA record to 3-0 and all by knockouts. 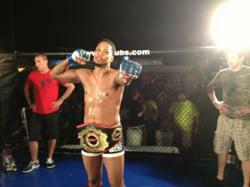 Many more spectacular highlights to come from New Champion ,James Williams, and the rest of the Top Flight MMA camp. Stay tuned for the Highlight video from this electrifying championship fight.